Near the coast at the far western side of Ghana, near the border with Cote d’Ivoire, is a village that is unique in all of Ghana. 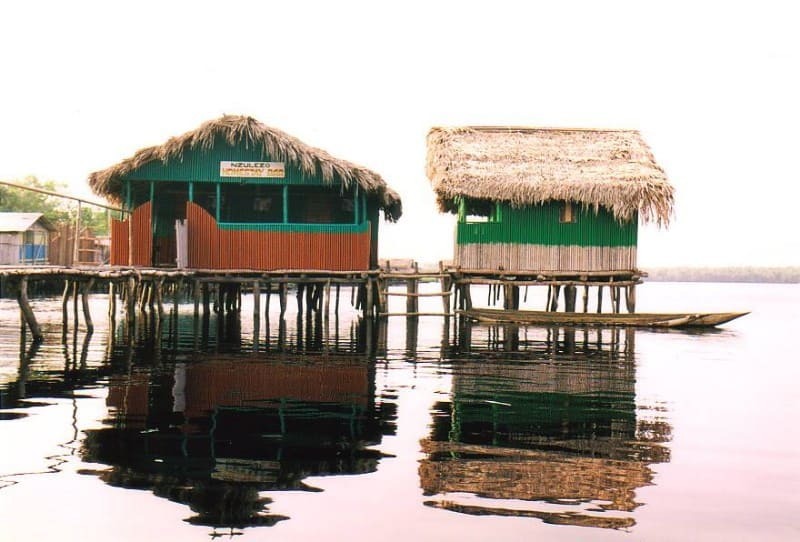 Spectacular scenery of the 400-year old stilt propped water settlement of Nzulezu, is a unique village built on stilts in Lake Tadane, which is home to hundreds of people in the Western Region. Nzulezu is an Nzema word meaning ‘surface of water’. The inhabitants of the village are said to have migrated from Walata, a city in the ancient Ghana Empire, the earliest of the Western Sudanese States. According to tradition, ancestors of the village were brought to their present place by a snail. The serene ambiance of the surrounding landscape, coupled with the general activities of life on stilts points to a dynamic relationship between man and nature. It is essentially one long pier, called Main Street by the locals, with buildings constructed on both sides. One side of the ‘street’ are living quarters while the other side of the street has businesess, the school, a community center and other commercial ventures. village life is adapted to the unique environmental conditions, and all activities such as the pounding of fufu (a traditional meal), schooling, worship, baptisms and burials are carried out on the lake. It is said that the lake averts possible disasters such as fire outbreaks. 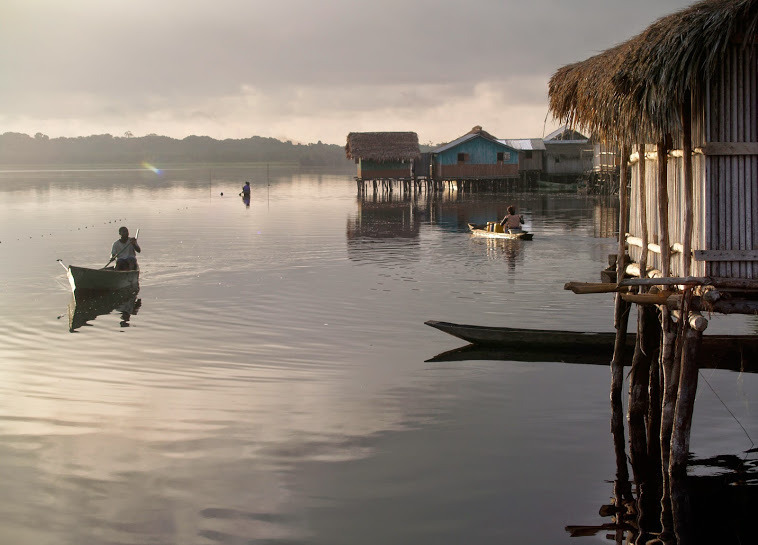 The people of Nzulezu still adhere to traditional norms and taboos. For instance, Thursday is a sacred day on the lake, and on this day, the villagers do not engage in any strenuous activity. Today the village subsists on fishing, farming on nearby land, and tourism. There is also guesthouse at the village, but do not expect modern standards. 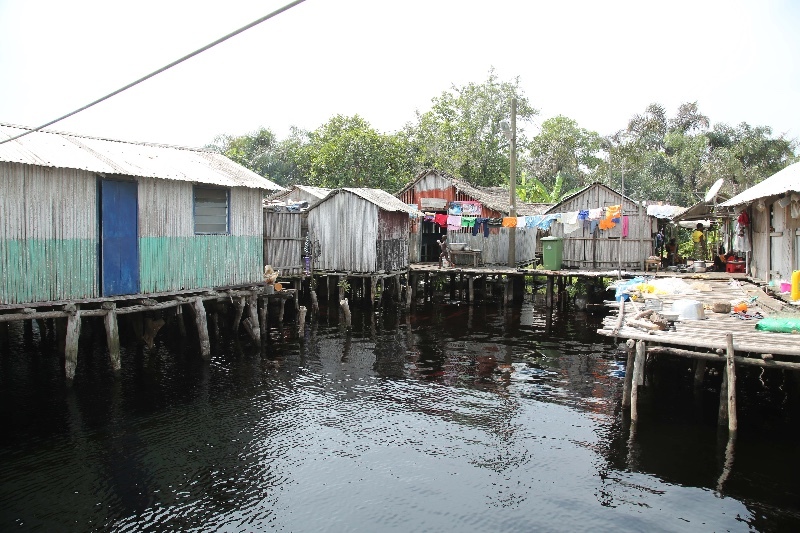 The Nzulezu stilt village is not connected to electricity, but there are a significant number of television poles attached to almost every home in the village. These are powered by car batteries. For source of light in the night villages use lantern, flash light or rechargeable lamps to move about. 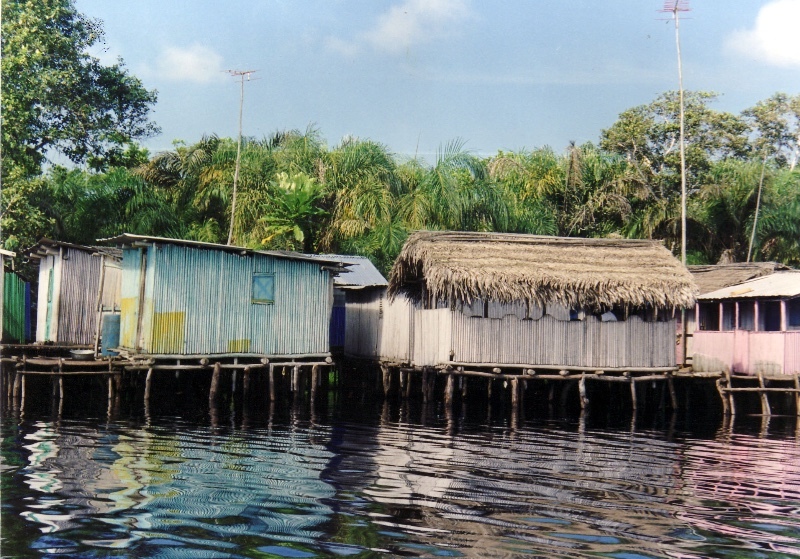 To the amazement of visitors, villagers carry on daily life as if they don’t live on stilts. The one-hour dugout canoe trip from the Beyin visitor centre to Nzulezu passes through a pristine series of marshes, swamp forest (the largest stand left in Ghana) and open pools rich with wildlife, including crocodiles, egret, heron and kingfishers. This natural area has been designated as an Important Bird Area based on criteria from Birdlife International. 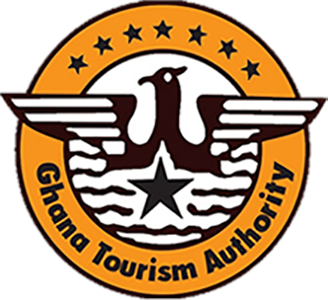 In addition, the beach adjacent to the visitor centre is the site of a sea turtle conservation project in cooperation with the Ghana Wildlife Society. The project seeks to protect three endangered turtle species that nest on the beach. Evening tours are offered to see the massive turtles laying eggs and their tiny hatchlings making their way to the sea. One of the highlights of a visit to Nzulezu is certainly the journey to get there. Nzulezu is one part of the Amasuri Wetland, a ramsar site and the largest inland swamp forest in Ghana. After driving as far as the unpaved road will allow for the current conditions, there will be a short walk to get to your canoe. A canoe ride of 45 minutes to an hour passes narrow, lush channels, open plains, and finally the wide expanse of Amansuri Lake. The ride is safe and lifejackets are available. More birds and monkeys are seen on the canoe trip to Nzulezu during the rainy season (May 15 through August) and you can canoe the entire way, versus walking the first 1 km during the dry season. Guided sea turtle walks are offered October through August. 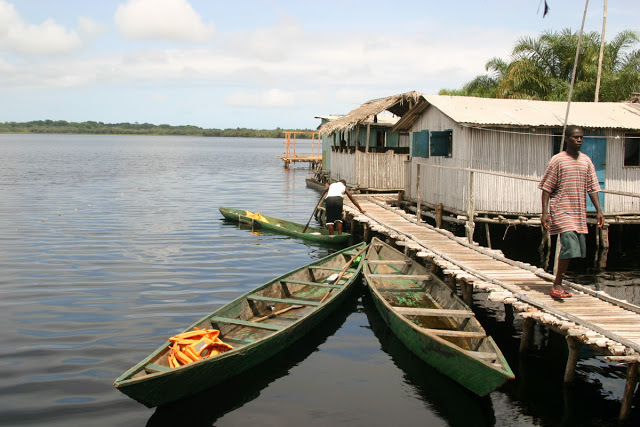 Nzulezu has a guesthouse called the Homestay Bar and Rest house that is part of the stilt village. The small window in each of the rooms looks out onto the lake and each has two single beds (sheet and flush toilet, but no mosquito net or towel). Meals and liquid refreshments are available. Camping is also available at the visitor centre in Beyin.  8 am to 4 pm daily. From Takoradi, travel 90 km west to the visitor centre in Beyin. Nzulezu is 5 km north of Beyin by canoe. The village of Nzulezu is about a 7 hour drive west of Accra. Childhood home of Kwame Nkrumah, the first president of an independent Ghana. Help to protect the endangered sea turtles, their eggs and hatchlings from predation by animals and villagers by participating in evening beach tours and conservation efforts at the visitor centre in Beyin.